Throughout his career, Arup's roles in the construction industry continued to be many and varied, and this is reflected in the history of the company that bears his name. 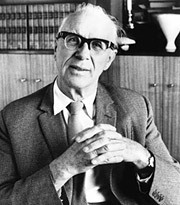 After World War II, at the age of 51, Arup set up a firm using his own name — Ove N. Arup Consulting Engineers, dissolving Arup & Arup Ltd.
Later the same year (1946), the firm became Ove Arup & Partners with Ronald Jenkins, Geoffrey Wood and Andrew Young all on board. In 1963, with architect Philip Dowson, he formed Arup Associates, a firm of architects, engineers and quantity surveyors. In 1970, Ove Arup Partnership became the parent company to both Arup Associates and Ove Arup & Partners and the many branch offices it had opened around the world in places as far-reaching as Africa, Asia, Australia and the Caribbean. The practice continued to grow into one of the largest and most world-renowned. Since 2000, it has been known simply as Arup. In the course of its history Arup's has become famous for its contributions to an impressive number of significant projects, including Sydney Opera House, Centre Georges Pompidou in Paris, Lloyds of London HQ, Beijing National Stadium, Millennium Bridge in London, Øresund Bridge linking Sweden and Denmark, the Channel Tunnel Rail Link (High Speed 1) and a host of galleries, museums, libraries, stadia, airports, bridges, railways, tunnels, colleges, cathedrals, high rise buildings, masterplans and more. Among the most significant of Arup's early partners was Peter Dunican, who joined in 1956. Dunican's passion to aid in the post-war drive for industrialised housing accelerated the firm's profits. In this respect the new firm was an exciting and important collaboration for Arup. But it also left him a little cold and he craved a consultancy project that would challenge his dedication to an 'ideal' engineer-architect design relationship. As the firm expanded, he was to became less involved and to an extent disappeared from the projects his colleagues were working on. But he was still the public face of the company, promoting its ethos and addressing universities and societies. Throughout his career he was outspoken on the subject of professional training for engineers and architects, promoting the need for radical changes in approach. He also published extensively, progressing in print the idea of architect-engineer collaboration. One of his most famous lectures is 'Structural Honesty', given in London and Dublin in 1954. In it he implied that there is no such thing as structural honesty in structures, only in the early communication between engineer and architect, before an architect has a chance to blame the engineer at a later stage. He didn't change the minds of architects with such lectures but they are records of his confidence in the idea at this point. However, there were some projects in the late 1940s and 50s to which he was happy to attach his name. These include the Brynmawr Rubber factory (1951), the large-span concrete shells roofs of which were designed by Ronald Jenkins, and the Festival of Britain footbridge (1951) done in collaboration with Maxwell Fry and Jane Drew. Other architects he worked with include Guy Morgan, Michael Scott and the firm YRM. Although no longer working closely with Lubetkin, Arup continued to keep in touch with the thinking of the Modernists. He attended two influential CIAM meetings in 1951, one in Hertfordshire, the other London. Both Le Corbusier and Gropius spoke, though he only heard the latter. CIAM meetings were a good way to meet interesting people who were keen to discuss philosophical issues. Many of Arup's early architect connections continued to work with him all through their careers. Denys Lasdun, who had been one of the members of Tecton, is an example of this. In 1964 the Lasdun-designed Royal College of Physicians headquarters on London's Regent's Park was completed with advice from Arup. As a way of securing work, all through his career Arup used the strategy of quickly contacting architects who won design competitions to congratulate them and put forward the firm's name. 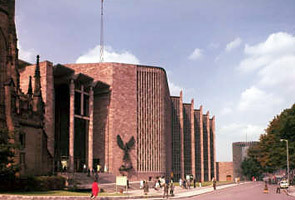 This was how the Coventry Cathedral project with architect Basil Spence came about. And it was also part of how he secured the project that came to dominate the later part of his life — Sydney Opera House. Working as consultant in conjunction with the Architects Co-Partnership, Arup acted as structural engineer for Brynmawr Rubber factory (1951). 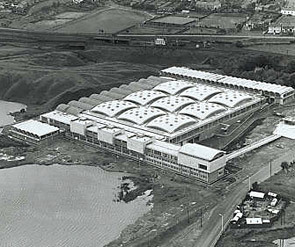 The large-span concrete shell roofs were designed by Ronald Jenkins. Now demolished. Ove Arup approached architect Basil Spence seeking the structural work on the new Coventry Cathedral (1962) for Ove Arup & Partners. Povl Ahm, who had joined the firm in 1952, worked closely with Spence on the project.